Welcome to the fourth tutorial in our “Getting Started” series. In this tutorial you will learn about the Communication section. The Communication Section provides tools to assist you greatly in the management of client and supplier contact information. From the Contact area important telephone numbers, email addresses and street addresses can be accessed. Your system also comes with a number of default system messages for things like confirming appointments. These have already been setup for you and will automatically include your clinic's important information. Should you wish to alter them for any reason, they can be changed from the Email section. More information on how to do this is available here. 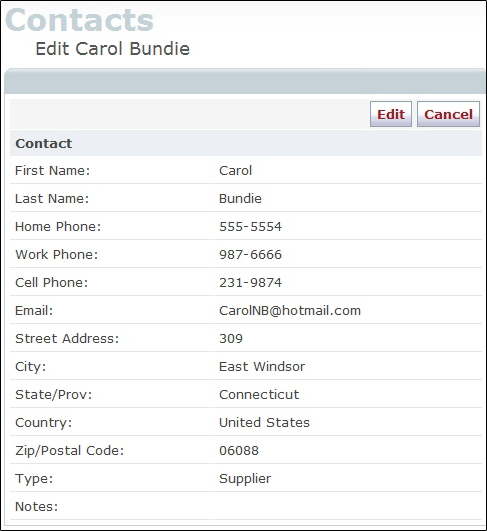 For this tutorial, we will be focusing on just the contact information. CONTACT LIST - Your contact list is intended to provide a directory of important telephone numbers, email addresses and street addresses for individuals that are critical to the day-to-day operation of your massage practice. Here you may add contact information for important clients, key suppliers, colleagues, industry experts, etc. Note: If you have already entered your client profiles into the system, you can automatically add them to the contact list by checking the “Include as contact” box on their client profile. GROUP EMAIL - Email addresses can be grouped into convenient practice specific group mailing lists; client groups, referral partners, supplier groups, colleague groups, etc. can easily be created. Creating email groups will simplify your communication tasks. Note: Once you have entered your contact information and created your email groups, both will become available from the “Email” section. 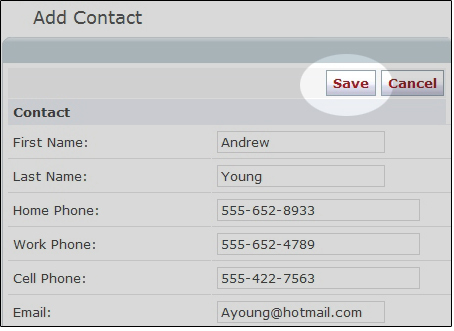 ADDING CONTACTS: To create a new contact, click on the Add New button . When you are finished entering the client information, click the Save button . EDITING CONTACTS: To change existing client information, click on the Edit button . REMOVING CONTACTS: To remove a contact from the system, simply click on the delete icon . 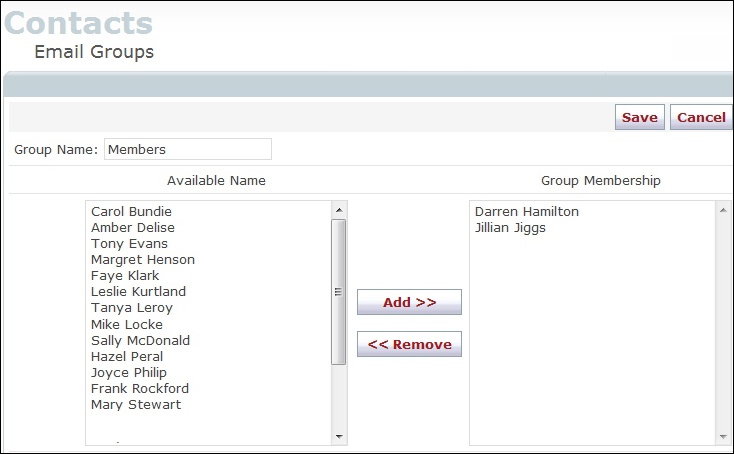 GROUPING CONTACTS: From the Email Groups tab, click on the Add New button to begin a new client, and use the forward and back arrow buttons to add and remove contacts from the list.